I’ll tell you a secret. March 2016 will be the last month of the blog series “Back to Gettysburg on Tuesdays.” But don’t worry – you’ll still get weekly Civil War history articles through a completely new series! In this last month of Gettysburg, I thought it would be fun share some thoughts from the research and writing process of Blue, Gray & Crimson. 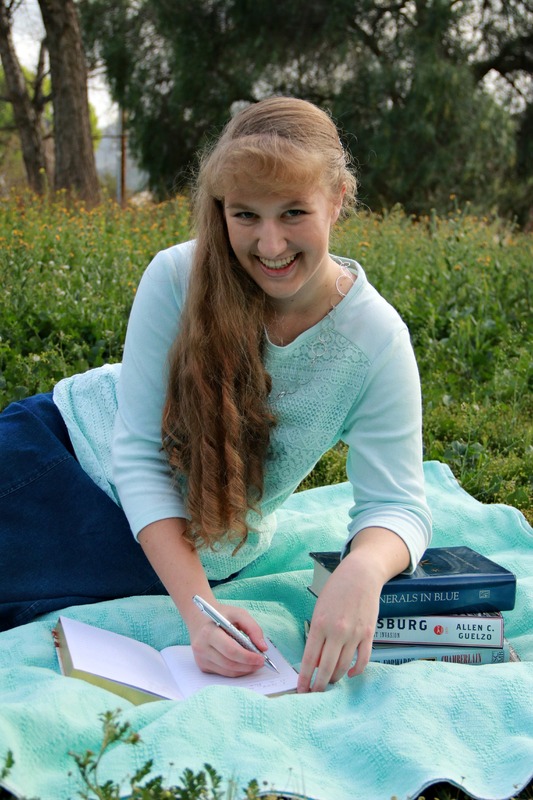 Today, I’ll give you a little glimpse into the “book of inspiration” which helped solidify the creative foundations of my historical novel. I read a stack of books about writing before I started, learning about story structure, grammar, and inspiration. I made plenty of mistakes (so thankful for good editors and proofreaders! ), but one thing that was extremely helpful was collecting inspirational pictures. For years, I’d been saving photos that captured an idea, an expression. A 30 page scrapbook was crafted with pages for each major character, setting, and a few important scenes. I used photographs, historical quotes, phrases I created and liked, and background “mood” paper. The inspiration scrapbook was very helpful as a sort of reference or food for the imagination. And I’m using this tool again on my current project, but this time on a secret Pinterest board! Here’s a photograph of the scrapbook page for the character Thomas Russell. He’s considered a minor character in the story, but his role is crucial to the plot and drive of the tale. When crafting his character, I envisioned a strong, likeable character – the kind of guy that we’d all like to have as an older brother or friend. So here’s how his character and important detail reminders were built on the scrapbook page. Next is a historic Civil War photograph of an officer. Thomas isn’t an officer, but I like the man’s expression and appearance. Two photographs from re-enactments are also included on the page. One shows a cavalryman gripping a pistol and reining his horse; that represents part of the fight Thomas is involved in before he meets the Westmore family. The other photograph shows horse and rider blurred because of the speed of the gallop; that’s a reminder of the importance (and scary part) of being a messenger on a battlefield. And then, there’s a picture of beautiful chestnut horse with a large white blaze on the face. That represents Thomas’s horse, who is a wonderful “problem causer” at a couple points in the story. There’s a list of character qualities on the side of the page – reminders of what I wanted to convey through this character: Practical, Appreciative, Stoic, Courageous, Informative, Encouraging, Observant, Reserved, and Friendly. 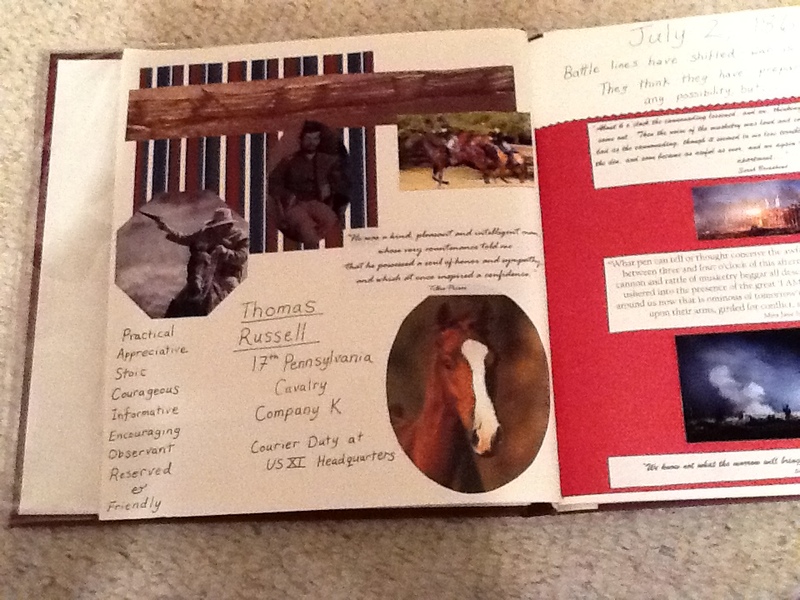 In the center of the page, surrounded by photos, a quote, and brainstorming text is the “announcement” of the created character: Thomas Russell, 17th Pennsylvania Cavalry, Company K. Courier Duty at US XI Headquarters. History. Crafting stories of characters in tough settings. Actually getting the ideas onto paper (or the computer) is the challenge. I’ve learned that sometimes a collage of ideas and images can help. Rarely is it one image that can create a character. I prefer to collect inspiration from a variety of sources, but then I have to craft a character that’s mine. Realistic, believable, likeable (theoretically), and crucial to where I want to turn the story. And that’s part of the fun of writing. How else do you get to take the best and worst of human nature, dream up someone handsome or pretty or common, and start bringing a character to life through written words? It’s hard, but I think it’s a marvelous challenge…especially to create a character who fits a past time period accurately.